The Glen and Yvonne Hollenbeck family of Clearfield will be honored at the 29th annual Casey Tibbs Foundation tribute dinner on Nov. 3. The Hollenbecks will be honored as the ranch cowboy family. Glen’s grandfather Earl, produced some of the first rodeos in the Sandhills of Nebraska, circling Model T’s and wagons around to create an arena. Glen become one of the top pick up men in the country and trained and mentored others such as Steve Sutton. He was the 1960 world champion calf roper. 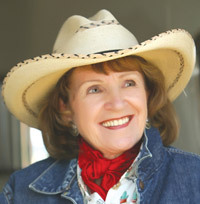 Yvonne was a professional rodeo organist and secretary for many rodeos, sometimes handed both duties at the same rodeo. At the age of 40, Glen won the championship calf roping in 1982, against much younger competitors. 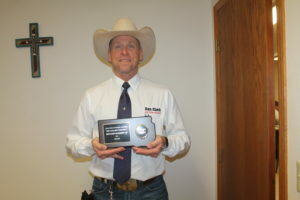 He won the U.S. Calf Roping Association championship in his age division in 2008. In 2017, at the tender age of 75, he won the senior pro association world championship. Sons Shawn and Jay excelled in calf roping and other family members actively participate in rodeo. 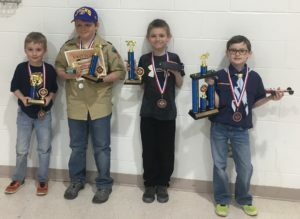 The Winner Pack 100 Cub Scout Program of BSA held its annual Pinewood Derby on April 22. 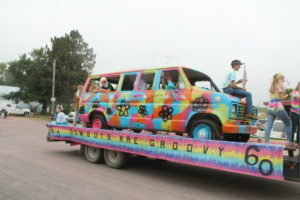 Nearly 25 entries were received, with participants receiving medals. Fall recruitment is currently underway for youth interested in joining scouting. Parents are welcome to register their child at the upcoming parent/scout meeting to discuss popcorn sales on Thursday, Sept. 27 at 6:30 p.m., at the Scout Cabin in Winner. Parents may also contact Charlie Grossenburg at 840-9010 for more information. 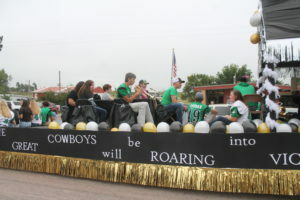 Winners have been named in the entries in the Colome High School homecoming parade. Brad Schramm of Winner will be inducted into the South Dakota Umpires Association hall of fame on Sept. 29. 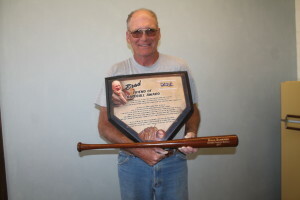 This will be part of the South Dakota Amateur Baseball hall of fame at Nick’s Restaurant and Lounge in Madison. The banquet opens with a social hour at 5:30 p.m. The Winner Area cheer team placed second at the Spearfish Invitational on Sept. 10. “This was a huge win for us,” said coach Val Ewing. There were five Class AA schools there and to compete with those schools at that level is just what Coach Novotny and Coach Ewing are looking for. Winner beat all of the A schools,” said the coach. “We have never gone to this competition and even though it was a really long day it was great to get to see some of the teams from the far west side of the state,” added Ewing. The Winner cheer performs at the half time of the homecoming football game on Sept. 21. Winner Area dance took third place in Spearfish. Coach Cyndy DeMers said the team scored their highest in the kick category and performed their best routines in pom and hip hop. Spearfish won first in dance with Rapid City Stevens, 2nd; Winner, 3rd and St. Thomas More, 4th. Austin Calhoon and Erik Scott won first place in the Wesson Littau Foundation golf tournament over the Labor Day weekend. They shot a 33. Second place in the championship flight went to Justin Zeigler and Jason Beehler with a 34 and third to T. J. Owen and Jayme Owen with a 35. Jason and Candi Sachtjen won the first flight with a 39. Second went to Tyler and Danette Tobin with a 39 and third to Dawn Andel and Heidi Lang with 39. Stacy and Megan Halverson won the second flight with a 42. Grady Myers and Quinten Lavoy took second with a 42 and Chad Peterson and Peggy Heilman took third with a 42. Luke Littau and Doug Mitchell won the third flight with a 45. Second went to the Vaughn team with a 45 and third to Shelly and Wayne Kindt with a 45. 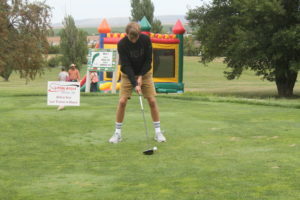 The tournament raised money for pediatric cancer research. Direct Support Professional (DSP) Week is Sept. 91-15. 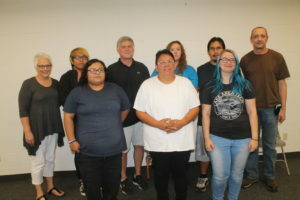 Community Connections Inc. in Winner employs 67 persons with 54 positions being in direct support professional. DSPs ensure people with disabilities have the necessary supports that enable them to live, work and enjoy live as independently as possible in their community. DSPs can work in a number of different settings and often have opportunities to share their own passion and talents with the people they support. The direct support workforce is made up of 3.6 million workers in the United States. The demand for direct support workers is expected to increase by 35 percent from 2008 to 2018. DSPs assist people receiving community human services in a wide range of activities such as meeting personal needs, making friends, finding a job, understanding rights and making choices, taking medications, learning new skills and facilitating connections to the people, resources and experiences necessary to live full and safely in communities of their choice. South Dakota’s network of Intellectual and Developmental Disability (I/DD) non profit service providers reach every corner of the state and provide services to approximately 4,360 South Dakotans with I/DD and employ approximately 3,491 people. DSPs have highly specialized and important jobs in the support of people with I/DD. The DSP position is the backbone of the Intellectual and Development Disability services. DSPs require extensive training in behavioral intervention, medication administration, crisis intervention, communication and person centered supports. DSPs routinely make sound judgments regarding behavioral health and general safety. DSPs have to meet increasingly complex regulatory requirements. Melony Bertram, executive director of CCI, says the career is rewarding because DSPs help the people they serve learn new skills and reach life goals. On a daily basis, DSPs help individuals with tasks most other people take for granted. Tasks like cooking, cleaning, showering, toileting, leaving the house, shopping and managing money take a little more effort for individuals with IDD. DSPs assist with tasks individuals cannot do for themselves and teach tasks individuals can learn to do themselves. Both the individual and DSP feel a great sense of accomplishment when the individual learns to complete a new task. “Without DSP’s our business would be obsolete. Direct Support Professionals are the heart and soul of the what we do,” said Bertram. 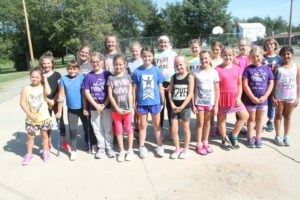 This is the second year for the Girls on the Run program in Winner. There are 20 girls in third to fifth grade in the program. The girls and coaches meet twice a week on Monday and Wednesday from 3:45 to 5 p.m.
Darbi McIntyre and Bobbie Viedt are running buddies. Bella Swedlund is the student volunteer who is helping. Foster said the program teaches life skills through dynamic, interactive lessons and running games. The curriculum is taught by certified Girls on the Run coaches and includes three parts: understanding ourselves, valuing relationships and team work. Running is used to inspire and motivate the girls. Each year the girls do a community service project to give back to the community. Last year the girls decorated pumpkins with the residents at the Winner Regional Healthcare Center long term care center. Girls on the Run is a 10 week after school program like no other. The program is designed to allow every girl to recognize their inner strength. The Girls on the Run curriculum inspires girls to define their lives on their own terms. Throughout the season, the girls make new friends, built their confidence and celebrate all that makes them unique. Lessons also encourage positive emotional, social, mental and physical development. Participants explore and discuss their own beliefs around experiences and challenges girls face at this age. They also develop important strategies and skills to help them navigate life experiences. They start with helping the girls get a better understanding of who they are and what’s important to them. Then, they look at the importance of team work and healthy relationships. Finally, they girls explore how they can positively connect with and shape the world. Physical activity is woven into the program to inspire an appreciation of fitness and to build habits that lead to a lifetime of health. At the end of the three-month session, they girls will take part in a 5K run in Sioux Falls on Nov. 11.